Again. Patients were led to believe, after a tide of troubles with these devices when they were first introduced, that these devices had gotten safer and better. But that wasn’t necessarily so, the Associated Press reported. Instead, the FDA had allowed makers to aggregate complaints, filing them in bulk, so, statistically, it appeared as if there were many fewer reports of problems than had occurred. In 2008, the agency asserted it had just 300 breast implant reports. But when regulators changed their processes, forcing makers to file individual complaints, their number skyrocketed — to more than 8,200 injuries in 2018. Critics also have assailed the FDA for how it tracks medical devices, so problem products can be discovered. Patient safety advocates, noting technology advances, long have urged the agency to require devices and their parts to carry individualized ID numbers. These fast could become part of a database, linked to complaint files, to surface issues and problems. But critics note that such identifiers with breast implants, for example, are printed on their shipping boxes. Those get opened and tossed, de-linking the product and any problems until they became major — and many patients have suffered harm. Drug overdoses now are the leading cause of death for Americans 50 and younger, and the nation has reeled from an opioid crisis rooted in wrong ways to deal with patients’ pain. But, the Associated Press, again, reported that a major alternative therapy — the use of medical devices to provide electrical stimulation to the spinal cord to short-circuit nervous system signals for pain — too often has gone awry. Instead of helping patients already in agony, the devices have shocked or burned them. Some users “have suffered spinal-cord nerve damage ranging from muscle weakness to paraplegia,” the news service reported. The AP story, a cooperative venture with international partners (see below), details how spinal stimulators have been part of an industry awash with cash payments — to doctors and hospitals — and how these have swayed care-givers to recommend and use brands and specific devices. Further, the AP reported, the devices have received relatively light-weight scrutiny and oversight. That’s partly because pro-business lawmakers and the device industry pummeled FDA officials into policies and practices that waved at products and that hastened their path to markets. The stimulators, in particular, relied on an FDA approval process dating to the 1970s in which makers could claim the devices were akin to products already around and approved. Gottlieb has just said he wants to agency to toughen up these so-called “510(k) approvals.” That news comes too late for injured patients, who will have to tell themselves that, effectively, the FDA allowed rocket-like 2018 sports cars into use because they sort of seemed like Corvairs. Failed international and domestic cooperation and coordination. Although it is true that European experts may disagree with their American counterparts, and Asian regulators may have yet more different views, the International Consortium of Investigative Journalists (ICIJ) and NBC News have found that patients around the planet suffer alike due to problem medical devices. Medical devices that broke, misfired, corroded, ruptured or otherwise malfunctioned after implantation or use — despite assurances by regulators, the industry and doctors that they were safe — were linked to more than 1.7 million injuries and nearly 83,000 deaths over the last decade …. Nearly 500,000 reports [of device-related harm also] mentioned an explant — a surgery to remove a device — in connection with an adverse event. There is no global system to make sure that a product found to be problematic in one country is not sold in another. An NBC News analysis found at least five devices about which other nations issued safety warnings and the FDA did not. These devices include a knee implant with high failure rates, a pregnancy test that gave false results, and dental drills that might damage nerves. In other instances, the FDA has lagged months behind warnings issued in other countries. This is unacceptable. In my practice, I see not only the harms that patients suffer while seeking medical services but also the carnage that can be inflicted on them and their loved ones by defective and dangerous products, particularly medical devices. 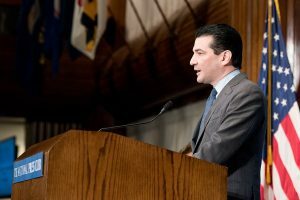 The news organizations deserve credit for dogging the FDA, spotlighting not only problem devices but also the bad policies, practices, and processes that endanger patients’ lives and well-being. The regulatory mess that the AP, NBC, the ICIJ, and others have exposed has been a public scandal for some time now, as the Wall Street Journal reported. Gottlieb deserves maybe, possibly a crumb of credit, for example, in taking on the creaky 510(k) comparative-clearance process. But it and other flawed and problematic agency approaches also have been chronicled in painful detail extensively, for example, in journalist Jeanne Lenzer’s book, “The Danger Within Us.” She called the unregulated medical device industry a “wild, wild West,” because Americans wrongly think the FDA, other regulators, and lawmaker are looking out for patients’ safety and best interests when it comes to artificial joints, cardiac stents, surgical mesh, pacemakers, defibrillators, nerve stimulators, replacement lenses in eyes, heart valves and birth control devices. The giddy-yap gang that wants Uncle Sam to speed along medical gadgetry of all kinds, including individual devices as well as costly technologies like robotic surgery tools and super-duper scanning devices, have helped boost the cost of American health care to sky-high levels. Without our getting the world’s best health outcomes, by the way. Far from it. How many patients will need to be injured, debilitated, and killed by profit-seeking device makers and their products before all the rest of us rise up and say, enough?